As you can imagine, I have a lot of quilts and am always looking for ways to display them. There are only so many that I can actively use on beds or as throws. I have them stacked in baskets here and there and I change them out often, but It seems a shame to hide them all in closets and cupboards when the fabrics, quilt designs and quilting are so good looking. I have a large wall in our family room that was just begging for a quilt display. I found a metal curtain rod at West Elm that seemed like it would work to display more than one quilt at a time. It is metal and strong and has a middle bracket so it won’t sag with the weight of many quilts. I mounted it a few feet below the ceiling level to leave room for art work above it and to also make it easier to grab the quilts if someone actually wanted to use one while watching TV. After all, that is what they are for, right? The rod can be adjusted from 44″ to 108″ This is the current grouping…a nice winter mix. The quilts from left to right…CHRISTMAS GOOSE from Thimbleberries Guide for Weekend Quilters, CHRISTMAS PATCHES from Quilts for My Sister’s House, EASY FAT QUARTER SQUARES from Basic Beauties and MOUNTAIN STARS from Thimbleberries Collection of Classic Quilts. The framed house picture is HOUSE OF HEARTS, a wooly made from a Thimbleberries pattern. Books are available from Landauer Publishing and Amazon. 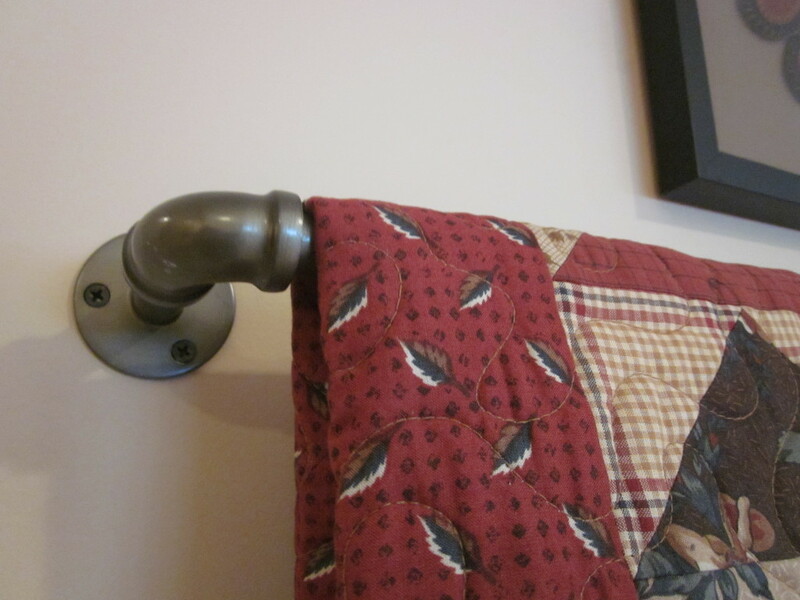 Here is a close-up of the bracket end of the curtain rod. This worked out so well… I am temped to put another one up in my sewing room. 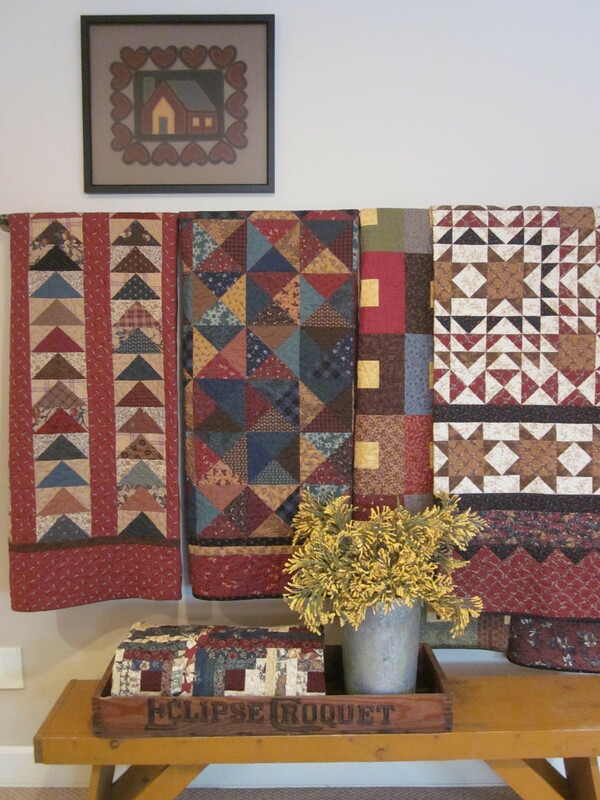 I would like to display some of my antique quilts that don’t necessarily match a room’s decor, yet are beautiful and definitely inspirational. Hi Lynette, I’m a bit late in leaving a comment only because I just didn’t know what to say! How you were able to find the most perfect rod out of all the choices available is beyond me. It looks right at home where you choose to put it. You really needed something substancial to hold the weight of those lovely quilts. I was thrilled to see the names of the quilts and from which books they came from. Thank you for that! PS: by now you know I’m a very big fan of your’s!! I keep your books out as coffee table books, they are beautiful!! As usual, I love hearing from you and so glad you are enjoying the blog. I have a UFO that I think is based on your patterns about 10-12 years ago. I have the center finished but can’t find the pattern to know how to finish it. Is there any chance I can contact you? I live in Hutch and this was from the Main street quilt shop when you were upstairs. I will need a whole lot more information than this to help. Perhaps you could bring it into Quilt Haven on Main and someone there could help you identify the pattern. Connie has been the one who has been at the shop since day one and could probably help. They could also contact me and I could stop by to see if I could help out. Then we will see if we can hunt down the pattern. Thanks for the tip about the hanging rod! I will look it up. I was so glad you added the closeup because I now plan to use my Winter Cottage red (and stash) to make a Christmas Goose wall-size quilt. I did not have the first two books you mentioned so I just now ordered them online. The name of the rod on the West Elm website is Industrial Pipe Adjustable Rod. What a great idea! The display definitely warms the room! Happy Valentine’s Day, Lynette! Love this idea and capability to display so many quilts. Christmas Patches is one pf my favorites.